With increased gas prices and a growing interest in environmental issues, many people worldwide have been looking to purchase cars with high miles per gallon (mpg) ratings. Making cars that have good gas mileage can be accomplished in various ways; including weight reduction using better aerodynamics and smaller engine, decreasing engine consumption, and using alternative power sources such as electricity. A drawback to making cars with good gas mileage is the possibility of sacrificed power. Some car buyers would like to have cars with higher mpg ratings, but do not want to sacrifice the performance of their vehicle in order to obtain it. 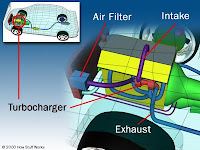 As a result, many car companies have resorted to an engine addition known as a turbocharger to make powerful vehicles while sustaining a respectable gas mileage (http://www.hybridcars.com). Turbochargers are a type of forced induction system that can be added to a car’s engine to increase the overall power, while also allowing the engine to better withstand extreme operating conditions. The turbocharger compresses the air entering the engine it is attached to. This compression allows the engine to squeeze more air into each cylinder, meaning more fuel can be added. With more fuel in the cylinders, a larger explosion can occur, resulting in more power output. The increased power improves the power-to-weight ratio of the engine (Nice 2000). In order for the turbocharger to achieve its “boost,” it uses the flow through the car’s exhaust to spin a turbine, which in turn, spins an air pump. The turbine in the turbocharger has the capability to spin at speeds up to 150,000 rotations per minute, which is about 30 times faster than the engines of most cars. The typical boost provided b y turbochargers is around six to eight pounds per square inch (psi). The atmospheric pressure at sea level is 14.7 psi, meaning a turbocharger is moving about 50 percent more air into the engine. The turbocharger, however, does not result in 50 percent more power. Instead, the power output is typically increased by 30-40 percent due to certain inefficiencies resulting from the a turbine in the exhaust system (Nice 2000). only used to boost the power of cars built for racing, turbochargers have evolved to be used as a way to save fuel without sacrificing performance (http://www.hybridcars.com/). Nice, Karim. "How Turbochargers Work." 04 December 2000. .
“Turbocharging, the New Hybrid.” 04 February 2008. . Turbo engines can make the same power as a normally-aspirated mirrlees k engine while using less fuel.Turbos also give engines more torque – often lower down in the rev range.Turbos with multiple optimum operating speeds for some race cars have many benefits. By going to Car Rental 8 you can find cheap car hires at over 50000 international locations.